I mentioned in my last post that I was going to start writing more blog posts on beauty products that I am currently trialling out. One of my NY's Resolutions was to use up my products and spend less on new ones - this has been the first time I have bought new makeup since last year, can I get a round of applause or something?! 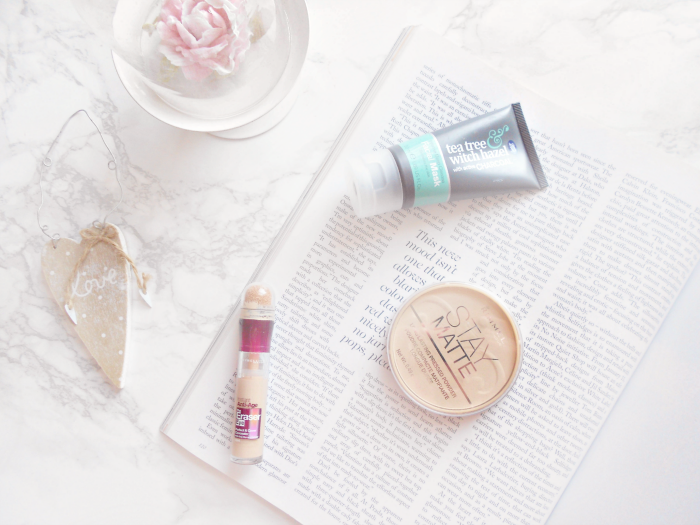 I picked up a couple of beauty products I've been meaning to try and decided to write about how I got on or if they live up to expectations. Boot's Tea Tree Witch Hazel Face Mask | I picked up Boot's own face mask due to the fact I kept pinching my mam's, so I figured it was about time I got my own. This helps calm my skin right down, allows it to look a lot more awake and refreshed as well as hydrated. It does reduce the redness of any imperfections a little bit but, not a drastic amount. I love the smell of the tea tree it really wakes you up and overall it's a very cheap and cheerful mask that I'd repurchase. Rimmel Stay Matte Pressed Powder | Yes. I am the last person in the whole entire world who hasn't tried this face powder out. Even growing up I never thought to give it a try as I've always been a firm, dedicated MAC customer. But I figured after using MACs MSF for a solid 8 years it was about time to try something else. I picked up the translucent shade just to be on the safe side and I've been trying this for the past 2 weeks. To be honest, I don't get the hype I mean, it's a great powder and sets my makeup off but, after 5 hours or so I could see it starting to disappear. I will happily use this for those short days out but, for long shifts at work or nice occasions, I will still be returning to MAC. Maybelline Eraser Eye Concealer | After seeing this hyped up everywhere for covering dark circles I decided to give it a whirl. I absolutely love everything about this concealer, from the sponge application to the actual results it is incredible. I picked up the lightest shade which is a little bit dark but it's perfect for covering dark circles. I like to draw out a triangle and blend it in with my Real Technique's Sponge as it's too liquidy for a brush blend. It instantly wakes my eyes up and covers up those hideous dark circles. Nobody needs to know I only had 5 hours sleep. What products have you been trying out recently?? I love peel masks I think they're so fun! Thanks for sharing these products. I've heard a lot of amazing things about the boots tea tree and witch hazel range, it's interesting to hear it didn't have ridiculously outstanding results. I've been on a beauty spending ban this month, but wow I can't believe you managed over two! I've heard awesome things about the under eye concealer too, I really want to try it out! It was hard work believe me! I stopped taking my bank card out at one point! You should definitely try it as I can see the fuss! It's hard to stop buying makeup but it was so worth it too as I used a lot of old stuff! Yeah it's very cheap and cheerful! So glad to hear others agree as it seems so overly loved! I agree I cannot leave the house without it now! - it runs out fast though. The powder from rimmel is the best, I love it! But I think the 25hs by rimmel too is way better. And the maybelline concealer I like it better for blemishes. Great post! I might give that one a go! And it's just an amazing concealer! i love the maybelline concealer! like you said the lightest shade is a bit darker than I would want it to be too, it's pretty much the same colour as my skin which is good for covering dark circles up but I like a concealer thats a few shades lighter and highlights my under eyes! i still love it so much though! Lovely post ! I love Rimmel's Stay Matte Powder, I have been using it for years. Thank you :) It seems to be in a lot of beauty bloggers makeup stash so it must be a popular one! Everyone and their grandma is raving about the Maybelline Concealer. I´m just starting to run out of my beloved Rimmel Wake Me Up Concealer so I take that as a sign to try out a new one. I also really loves the Stay Matte Powder but then again, I have rather short days out, so I don´t wear it for more than 5 hours most days. hahaha so so true! I can totally see why though. You should definitely give it a try it is so so so good! I do love the maybelline concealer! It's a good'un to have in your makeup! I still haven't tried that concealer either. Need to get on it!! You should it definitely lives up to the hype! I have tried all these products and love them all, great inexpensive finds. I wouldn't be without my Maybelline concealer or Stay Matte powder. There is always so much makeup out there to try! I didn't really get the hype with the Rimmel Powder either... I completely agree with you! The tea tree face mask sounds amazing! Aw thank you and oh it really is a lovely cheap and cheerful one!